PhilaFoodie: What Does Chicago's Repeal of the Foie Gras Ban Mean for Philly? What Does Chicago's Repeal of the Foie Gras Ban Mean for Philly? Yesterday, by an overwhelming vote of 37-6, the Chicago City Council repealed its ban on the sale of foie gras. The ban has been a source of embarrassment for the city since it was passed in April 2006. Philadelphia City Councilman Jack Kelly proposed a similar ban shortly after the now-repealed Chicago ban was passed. Kelly’s bill never made it out of the Committee for Licenses and Inspections. After narrowly wining re-election last fall, Kelly promised to lobby the newly-elected councilmen in January to support his bill. However, it is now halfway through May, Kelly’s bill has officially lapsed and we haven’t heard so much as a peep from Kelly. The lack of legislative progress has not deterred Hugs for Puppies, the local activist group that has been spearheading protests in front of restaurants that serve foie gras. The group’s questionable protesting tactics essentially have resulted in a de facto foie gras ban in Philly. With the exception of Le Bec-Fin’s Georges Perrier, the Philly restaurant scene’s more vocal supporters, like Ansill's Chef David Ansill, have taken foie gras off the menu for business reasons. Even London Grill’s Terry McNally, Philly’s foie gras poster woman, appears to have caved (a recent visit revealed that only the hanger steak with foie gras butter remains). Chicago’s repeal is important for Philly because, among other things, it undercuts an argument on which activists have strongly relied to make their case for banning foie gras: Because other legislative bodies have banned foie gras, Philly should ban it, too. This follow-the-crowd argument has always been flawed. The implication that one need only get in line and follow what others have done without independent scrutiny is inherently troubling. The argument also assumes, of course, that none of the bans were the product of activists’ bullying. [Ironically, the activist group Farm Sanctuary is claiming that Chicago’s repeal was caused by “pressure from political bullies and special interests.”] Plus, there’s never any mention of the fact that the numerous legislative bans proposed in the U.S. since Chicago’s ban was passed have either failed (e.g., Maryland) or have been buried somewhere in the legislative process to die a slow, quiet death. But now the follow-the-crowd argument has lost its teeth. Chicago was critically important to the activists—it was the first and only U.S. city to ban foie gras and, they maintained, it legitimized a path for other cities to follow. However, after enduring two years of ridicule and now repealing the ban in a loud, lopsided, public display, Chicago now stands for something completely different—the foie gras ban was a mistake. California passed a ban four years ago that doesn't become effective until 2012. However, after the more recent brouhaha in Chicago it’s unlikely that any U.S. city will ban foie gras now. More broadly, Chicago’s repeal also renews the debate as to whether it’s appropriate for local government to legislate what we put on our plate, at least in cases where there is no legitimate public interest to protect. Chicago’s repeal should be the death knell for any proposed foie gras ban in Philly. Time will tell. But the real question isn’t whether Philly’s proposed ban (now lapsed) will officially be declared dead. The real question is: If it is declared dead, will the activists gracefully walk off the field and let us eat in peace? For foie gras lovers, it was a day of liberation; for animal-rights advocates, a waterloo in the Windy City. On May 14, at the urging of Mayor Richard Daley, Chicago’s city council voted 37-6 to legalize the sale of foie gras in restaurants, overturning a nearly two-year ban on the fattened goose and duck livers. While animal-rights groups, who oppose the practice force-feeding of ducks and geese to produce foie gras, hailed the decision, critics derided it, calling it a case of government intrusion into the dining room. 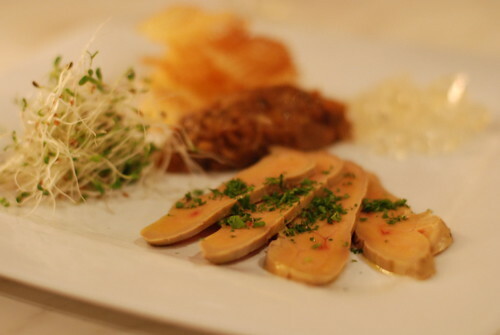 While some chefs introduced so-called foie substitutes, others openly flouted the law, keeping foie gras on their menus. Your defense of this horrid practice disgusts me. Do you deny the animal suffering inherant to foie gras? Have you no sense of moral ojection to override your own personal eating pleasure?